New Cat Under Cover. . . Attention Cat Lovers! This Is Weekend Cat Blogging #35! See fun feline photos & discover yummy new food blogs. Visit my pal Clare & her superstar cat Kiri at Eat Stuff in Australia for all the links to this week's kitties. And for even more pleasing pussycat pics, be sure to catch the traveling Carnival Of The Cats each Sunday night. I see your new cat has assumed what we, around here, call the "meatloaf position". 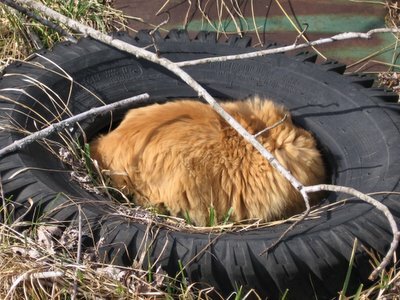 My theory is that cats feel protected when they draw themselves into the smallest possible shape, regardless of any actual danger, or lack thereof. Perhaps they also feel that if they are mistaken for a meatloaf they will not be a threat or challenge to others, who will carefully save them to eat later on? To follow up on Linday's comments, maybe the cat is assuming the meatloaf position because he suspects that many, like myself, detest meatloaf and find it completely unpalatable, thereby ensuring that he won't be eaten. Although I suspect that Farmgirl probably has a delicious meatloaf recipe that could convert even the most die-hard meatloaf hater into someone who'd give it a try! I can almost feel the warm sunshine this orange cat is soaking up in the photos! I had an orange tabby just like this. Kept him for 18 years. He lived a lovely long cat life. 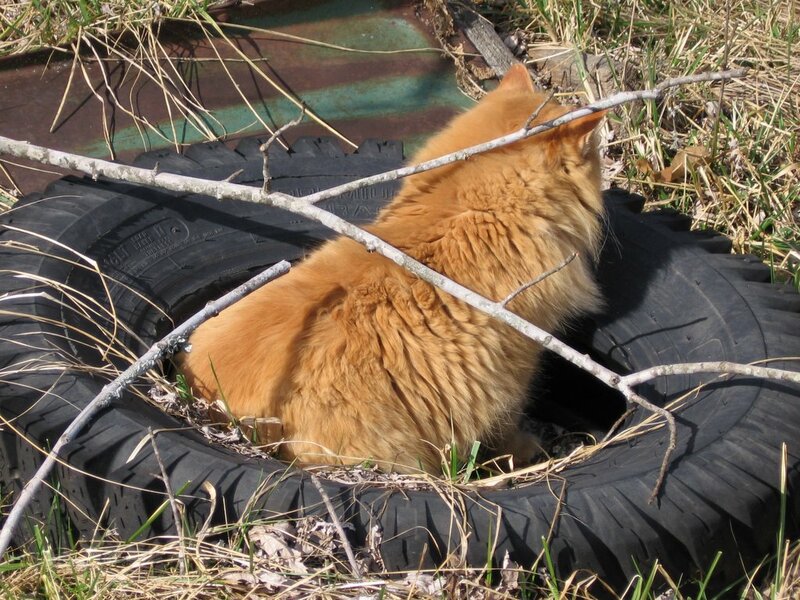 He would have enjoyed this tire too. Great blog. Love all the picture you have posted. I love this blog! I had a small farm in Illinois at one time and some of these pictures take me right back there...I will be a visitor more often! This yellow kitty thinks if his face is hidden no one can see him! I love yellow cats! Thank you so much for your answer!!! Your pics are fantastic like everytime. I love cats and your pics remember me to my "little monsters" here. I am anxious to see your next pics and receipes. Great photos there. So, is the second one worthy of inclusion in the COTC main page banner? Let me know if you want it added.